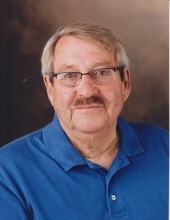 Timothy G. Larsen, age 81, of Burlington, passed away Monday, April 1, 2019 on the 13th anniversary of his wife’s passing, at Aurora Memorial Hospital of Burlington. Born in Racine on February 22, 1938, he was the son of Christian and Esther (nee Nelson) Larsen. His early life was spent in Racine where he graduated from Park High School. On July 1, 1989 in Racine, he was united in marriage to Bonnie Ahrendt-Braun. Following marriage, they made their home in the town of Spring Prairie. Bonnie preceded him in death on April 1, 2006. Tim worked for WE Energies as an engineer for 43 years. In his younger years, he enjoyed bowling, golfing and marching with the Kilties. In his adult years, he loved playing Texas HoldEm and belonged to a cribbage club and wine club. He crafted his own wine with good friend, Adam Rabe. Tim is survived by his children, Jean (Keith) Whiteside, Jeff (Geri) Larsen, Jay (Leonie) Larsen, Julie (Scott Geyer) Christensen, Jim (Tria) Braun, Janann Braun and Jodene (Tim) Strommen; grandchildren, Patti (Jerrod), Alyssa (Dustin), Kyle, Jessica (Josh), Justine, Jessica Rose (John), J.T., Mandy (Mike), Kayla, Emma, Joey, Taylor, Briara, Brody, Tanner and Tucker; great-grandchildren, Millie, Wes, Jackson, Savannah, Connor, Caydence, Kobe, John, Amber, McKenzie, Logan and Brysen. He is further survived by his very dear friends, Adam, Andy, Kathy, Linda, Nancy, Tammy and Tom. He was preceded in death by his parents, wife and siblings, Bob, Merloe and Joan. Services for Tim will be held Saturday, April 13, 2019 at Noon at Schuette-Daniels Funeral Home. Relatives and friends may visit with the family from 10AM until the time of service. To send flowers or a remembrance gift to the family of Timothy G. Larsen, please visit our Tribute Store. "Email Address" would like to share the life celebration of Timothy G. Larsen. Click on the "link" to go to share a favorite memory or leave a condolence message for the family.